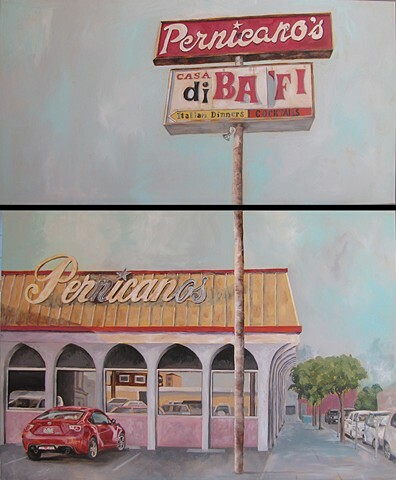 Pernicano’s Restaurant is located in the vibrant, urban neighborhood of Hillcrest. Originally opened in 1946, the Italian restaurant was once an extremely popular spot frequented by celebrities, especially professional athletes. The owner, George Pernicano, is part owner of San Diego’s football team, the Chargers. The restaurant closed in 1985, and has been vacant and decaying ever since. Hillcrest is urban and high-density; filled with fashionable boutiques and expensive bars and restaurants. It is the official gayborhood of San Diego, with a huge rainbow flag on Harvey Milk Street. Why is a 25,000 square foot building in the heart of Hillcrest (with large fenced parking lot) along Sixth Avenue sitting empty while drivers waste gas circling the block waiting for an open space? Pernicano won’t say, but it is rumored that he’s keeping it closed as a sign of his displeasure over how the character of the neighborhood has changed since he opened it in a different era in 1946. City officials and neighboring businesses were thrilled to hear recently that the building is finally up for sale.